With consumer spending accounting for more than two-thirds of economic output, the Commerce Department’s report on January retail sales suggested shoppers had a pulse after moribund activity in November and December. Sales rose 0.2% in January. Declines in the previous two months were revised downward. Excluding volatile sales for automobiles and gasoline, January retail sales climbed 1.2%, the most in eight months. Of 13 retailer categories, eight reported gains, led by building centers, sporting goods stores and online sites. In a sign of overconfidence among companies, business inventories rose 0.6% in January while sales fell 1%. The Commerce Department showed the ratio between inventories and sales rising again, as it has been since mid-2018. Although inventory stockpiles add to the calculations for economic growth, too much supply vs. demand suggests business operations aren’t lean and nimble. The broadest measure of inflation suggested little urgency for the Federal Reserve Board to resume its gradual raises in interest rates. 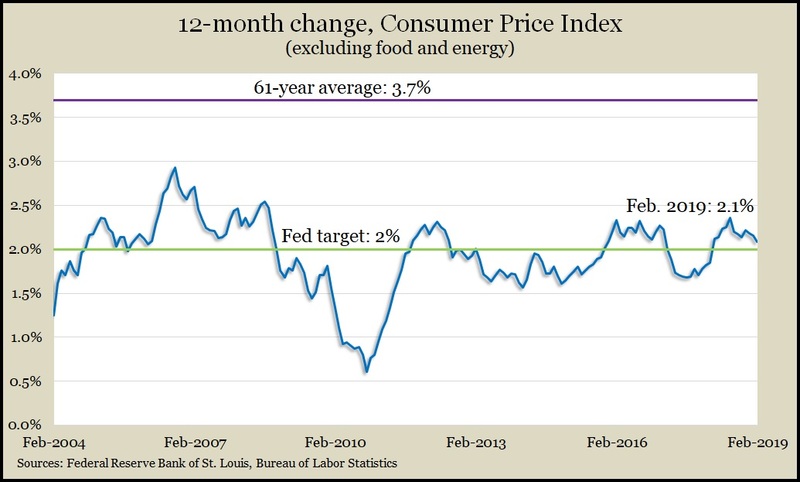 The Consumer Price Index gained 0.2% in February for the first change in three months. Energy prices—especially gasoline—rose after three months of decline, the Bureau of Labor Statistics reported. Excluding volatile food and energy items, the core CPI indicated a 12-month inflation rate of 2.1%, down from three months at 2.2%. Wholesale energy prices rose in February for the first time in four months, lifting wholesale inflation also for the first time since October, according to the Bureau of Labor Statistics. Year-to-year, the Producer Price Index rose 1.9%, lower than the previous month for the fourth month in a row. Excluding food, energy and trade services, the core rate for wholesale inflation grew 2.3% from February 2018. That’s down from a peak of 3.1% in September. The Commerce Department said orders for durable goods rose in January for the third month in a row, led by demand for commercial aircraft, which grew in five of the last six months. Excluding volatile orders for transportation equipment, orders for items intended to last more than three years contracted from December. Year-to-year, total orders rose 7.8% but only 3.7% excluding transportation. A measure of capital investment by businesses increased from December but was up only 3.1% from January 2018. Another Commerce report showed the pace of construction spending picking up in January after two months of decline. Money spent on construction has exceeded the pre-recession peak every month since September 2016, although it appears to have crested last May. Increased spending on government building projects helped boost results. The pace of spending on single-family housing declined 0.7% for the month and 7.2% from January 2018. The four-week moving average for initial unemployment claims fell for the third week in a row, hovering around low levels last seen nearly 50 years ago. Data from the Labor Department showed jobless claims 37% below the 52-year average, where they have been every week since early 2013. Employer reluctance to let go of their workers suggests a tight employment market, which should encourage consumer spending. The departments of Commerce and Housing and Urban Development reported a slower pace of new home sales in January. Single-family residences sold at an annual rate of 607,000, down 6.9% from the December pace and 4.9% off from January 2018. The inventory of houses for sale rose as a result, and the median sales price declined 3.8% from the same time last year. New home sales reached a recent peak of 712,000 in November 2017, up from an all-time low of 270,000 in February 2011 but down from the record high of nearly 1.4 million in July 2015. The Federal Reserve reported that industrial production increased slightly in February after a setback in January. Output from utilities—sensitive to weather fluctuations—led the turnaround. Manufacturing, which accounts for about three-fourths of industrial production, had lower output for the second month in a row. Capacity utilization declined slightly for the third month in a row, sinking to its lowest level since July. Manufacturers, miners and utilities have been below the 47-year average for total capacity since April 2008, suggesting inflation continues to be no imminent threat. Job openings rose to nearly 7.6 million in January, just below the record in November and another reminder of the tight labor market. According the Bureau of Labor Statistics, the number of openings rose 21.7% since January 2018, compared to a 4.2% rise in the number of employees hired. The gap between openings and new hires reached a record 1.78 million in January, and openings outnumbered unemployed job seekers for the 11th month in a row. A preliminary reading of consumer sentiment for March exceeded analyst forecasts as households in the bottom two-thirds of income told University of Michigan surveyors that they had expectations of higher income and lower inflation. A University of Michigan economist said, based on the results, consumer spending should increase by 2.6% in 2019 and extend the current economic expansion to a record 10 years.